PureVia is a sweetener developed by the Whole Earth Company. It contains Rebaudioside A, a natural calorie free sweetener which is an extract of the Stevia plant. It also contains Maltodextrin, which is a high glycemic (105) carbohydrate. This is used as a bulking agent, otherwise it would be very difficult to accurately measure the required quantity, as Rebaudioside A is about 300 times as sweet as sugar. Many people find the taste of PureVia excellent with little or no aftertaste. Other people find it acceptable in cold drinks but not in hot. Unfortunately there is a third group of people that find the taste unacceptable. I happen to fall into this group, I find the taste of Stevia unpleasant! It is probably to do with genetics, different people taste differently, and the taste of Stevia seems to vary considerably from person to person. To me it tastes sweet alright, but not pleasantly so. It seems to have a very empty taste that I cannot connect with, and it leaves an unpleasant aftertaste in my mouth. On the positive side Pure Via is one of the better formulations I have tried. Instead of using 2 teaspoons of sugar on my oatmeal I use one teaspoon of sugar and one teaspoon of Pure Via, and I find this very acceptable. I like to consume a small amount of Stevia each day for the health benefits. Because Pure Via has Maltodextrin, or Dextrose in certain countries (The mix varies) it actually has a glycemic index of 100. However it has an effective glycemic index of 10 because, on a weight basis, one tenth is required to equal the sweetness of sugar. Even so, this is not zero, and diabetics should be aware of this. There are Stevia products available that have a glycemic index of zero. 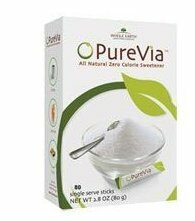 PureVia is a good product that is easy to use and replaces sugar spoon for spoon. It has generally been well received on the market and is one of the best tasting Stevia products available.